This building is also known as Sir John Boy's House was actually the shop for the Kings School when I arrived in Canterbury some 20 years ago. Sir John Boys was once the M.P and Recorder for Canterbury. The archeologists dispute this, see the report below. The building suffered a lot, there was a fire and the building became unsafe. 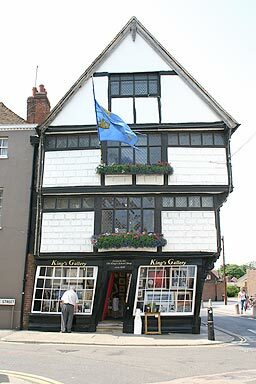 It was repaired and restored in the last few years, but in the interim the Kings School shop had moved over the road. The astounding lean is actually supported internally by a steel cage and accentuated by the door which is a recent addition.